(L) Mr Law Hang Kong of the Hong Kong Leisure and Cultural Services Department, and (R) Mike Worth, Treasurer of HKLBA, presented the Inter-schools Lawn Bowls Competition awards to teams from Yan Oi Tong Tin Ka Ping Secondary School (in purple shirts) and Lutheran Tsang Shing Siu Leun School (in grey shirts). on Tuesday May 1, 2018. (Stephanie Worth). 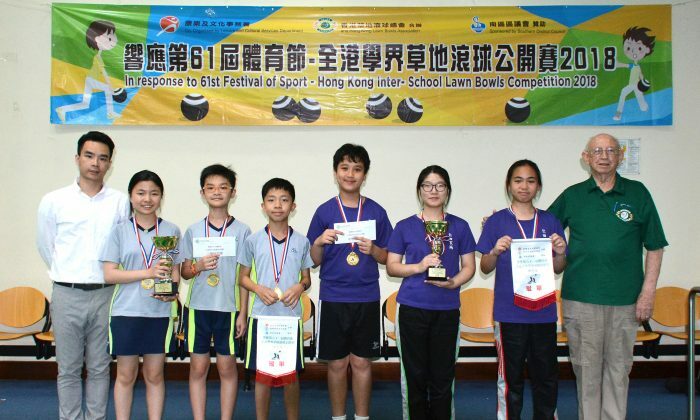 HONG KONG—There were all the usual names on the winner list of the Hong Kong Inter-schools Lawn Bowls Competition, which finished last Tuesday, May 1. Yan Oi Tong Tin Ka Ping Secondary School (YOTTKP) and Lutheran Tsang Shing Siu Leun School (LTSSLS) successfully defended their title in their relevant sections. This is YOTTKP’s fourth successive championship and their fifth title in the last six years. LTSSLS also won their Primary School title for the third year in a row. This year the number of entries has significantly increased to nine secondary schools and two primary schools who sent a total of 18 teams. However, this number is still short of the record in 2012 when 18 schools participated. The event was played at the Ap Lei Chau indoor greens. All schools were divided into group for roundrobin matches. With the winner of each group proceeding to the knock-out stage. Of the eight secondary schools taking part, YOTTKP showed their determination by sending three teams to participate. The champion team included Young Athletes Scheme member Anson Chow and Tuen Mun Sports Association player Elise Wai and Sandy Ngan. The team won five of the six games in the roundrobin stage and finished top of their section. They defeated another team from their school in the semi-final to face Yan Chai Hospital No.2 Secondary School (YCH2SS) in the final. 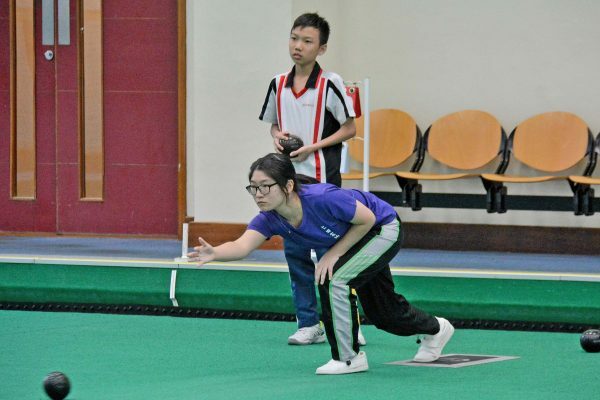 Sandy Ngan (delivering) from Yan Oi Tong Tin Ka Ping Secondary School skipped her team to win the Hong Kong Inter-schools Lawn Bowls Competition against Yan Chai Hospital No.2 Secondary School on May 1, 2018. (Stephanie Worth). The final was tight and the score was tied at 3:3 after five ends. In the sixth end, YOTTKP members shown great composure to drawn three great shots close to the jack. The YCH2SS skipper Ian Chung tried to trail the jack to win the match. Despite his weight control being good, the two bowls narrowly missed the jack and the team lost three shots in this end. YOTTKP took one more shot in the following end to win the game 7:3. Skipper Sandy Ngan believed that calmness is the key to success, “The match was very tight so we needed to remain calm and stay focused on the game. It allows us to perform our usual standard and forced the opponent to take some risky shots.” The team was very happy to win the title for their school. 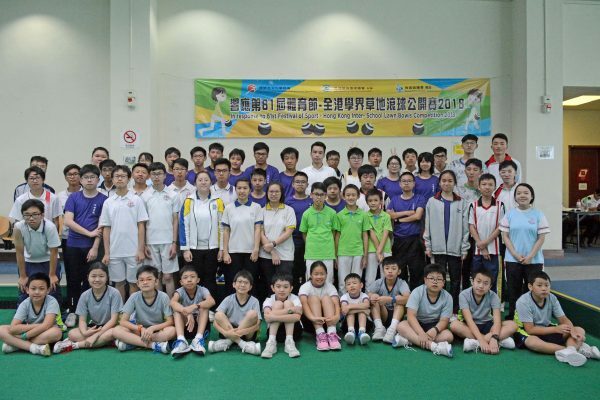 In the primary section, LTSSLS also sent three teams to the competition and the champion included last year’s winner Evans Yuen, U25 Age Group champion Argus Yiu and U25 Age Group runners-up Summer Shen. The team played in a one-sided final against STFA Lee Kam Primary School and won the match 9:3. The event was jointly organised by the Leisure and Cultural Services Department and Hong Kong Lawn Bowls Association (HKLBA), with sponsorship from the Southern District Council. The Premier League continues this coming weekend starting at 2:30pm on Saturday May 12, at all greens in Hong Kong.